Chassis and cooling specialist Deepcool has launched a new 'frameless' cooling fan set. 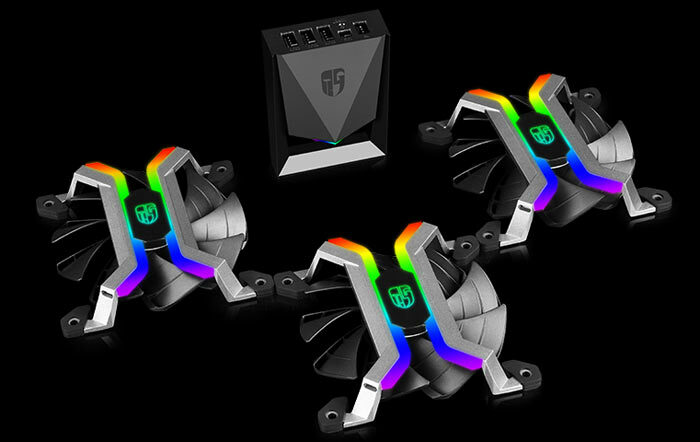 The new Deepcool MF 120 Aluminium Frameless Smart RGB Fan Set includes three identical 120mm fans with which to spruce up your PC system. 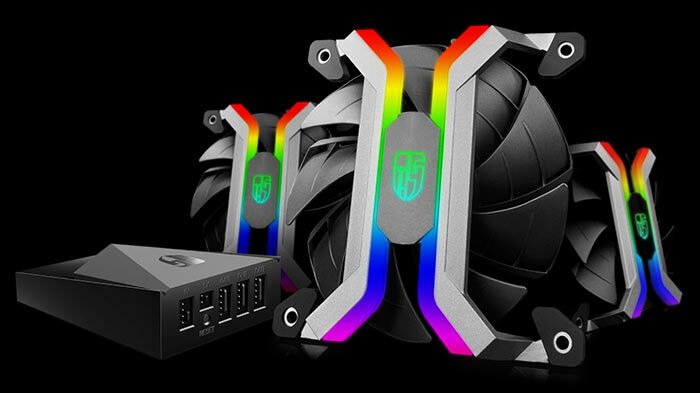 Facilitating a unique 'frameless' look, the fan holders are hewn from aluminium alloy and contain embedded RGB lighting. Deepcool provides a Wi-Fi controller and smartphone app with the fans and thus lots of lighting schemes and effects can be conjured up from your Android or iOS device. 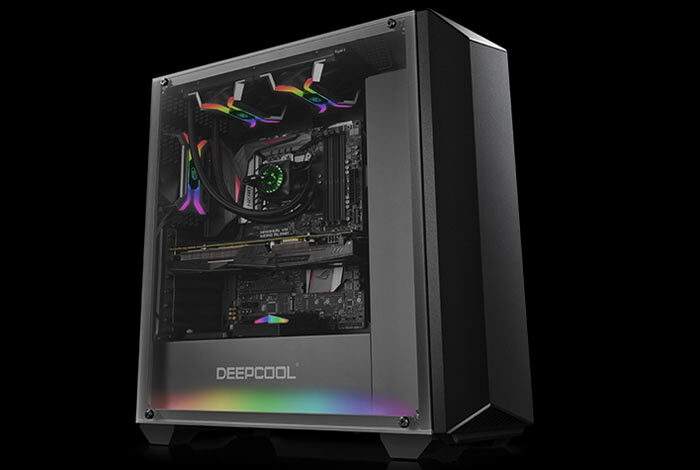 The fans employed are Deepcool's 120mm double-layer blade models (1-inch / 2.6 cm deep) which generate positive air pressure and deliver maximum airflow "with zero hindrance from the fan structure," says Deepcool. Fan speeds can range from a 'silent' 500rpm up to 2200rpm. Deepcool's controller box takes one PWM fan input header and provides three out, for its three fan set. Power in via a SATA power connector allows it to enable 2.4GHz Wi-Fi so you can control the fan's 16.7 million colour RGB features, and fan speeds, via smartphone app. It isn't clear whether the lighting can be controlled in another way - like via PC software. 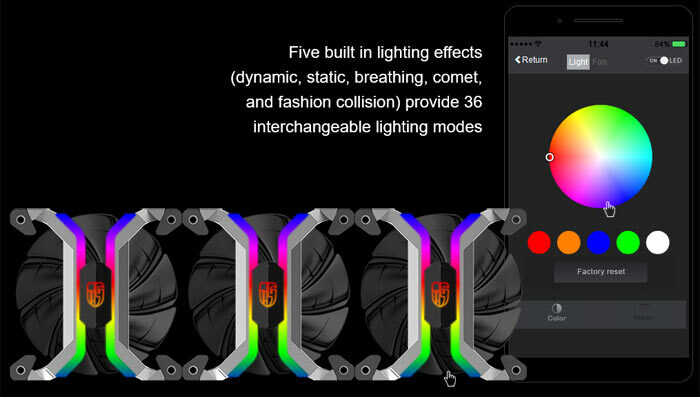 There are five built in lighting effects (dynamic, static, breathing, comet, and fashion collision) plus other settings to provide 36 interchangeable lighting modes in total. The above MF 120 fanset will become available in April, with an MSRP of US$109.99. Frameless in much the same way as most house windows are frameless. I wonder if the frames really are “hewn” from aluminium, which implies milling from a block (very wasteful and expensive) or if they are fabricated from strip (like windoe frames) or cast? in the “metal” they look neat…. have to say. I'm ignoring the RGB component, as I have'n tplayed with it yet……just focussed on the fan and controller design. Shape and form they look nice. This ugly af fans also manage to block airflow more than regular fans… who designed this?